It's in the Bag. 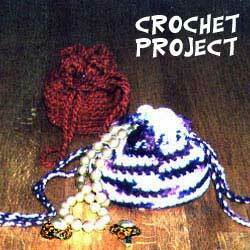 Fill this crocheted pouch with precious jewels, potpourri or whatever suits your fancy. Ch 4, join with a slip stitch (sl st) to form a ring. Rnd 1: Chain 1, 8 single crochet (sc) in ring; do not join, mark end of each round (rnd.). Work in back loops only beginning with Rnd 2. Rnd 2: [2 Sc in next sc] 8 times-16 sc. Rnd 3: [2 Sc in next sc, sc in next sc] 8 times-24 sc. Rnd 4: [2 Sc in next sc, sc in next 2 sc] 8 times-32 sc. Rnd 5: [2 Sc in next sc, sc in next 3 sc] 8 times-40 sc. Rnd 6-15: Sc in each sc around. At end of Rnd 15, join with a sl st in both loops of next sc. Now work remaining rnds in both loops. Rnd 16: Ch 4, skip next sc, [dc in next sc, ch 1, skip next sc] 19 times; join with a sl st in 3rd ch of ch-4. Rnd 17: Ch 1, [2 sc in next ch-1 sp] 20 times; join to first sc. Fasten off. Weave in ends. Make 2 twisted cords starting with a 3-yard length of yarn for each. Weave each through ch-1 sps of Rnd 17 in opposite directions. Knot ends of cord together, trim ends.